2014 Note: Target changed gelato suppliers at the beginning of the year. 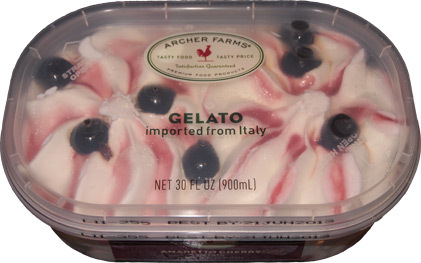 Instead of "imported from Italy", it now says it's "Italian-style frozen dessert" and it's made in the U.S. While popping up in other parts of the country last year (apparently), I've finally seen Archer Farms gelato pop up at several Targets in my area. Gelato has come to earn my respect over these past few years, so it seems only fitting to get these guys up on the blog. This is Archer Farms Amaretto Cherry Gelato - imported from Italy (funny, I've seen that statement before on other store brand gelatos). I always forget what Amaretto means..... "Amaretto is a sweet, almond-flavoured, Italian liqueur" (from Wikipedia). Well, that explains why there is almond paste in this one. It was $4.99 for a small 30 fl oz container, but the look of it (and it's gelato brothers) keeps catching my eye... wait, you don't think it's that catchy? Now does it catch your eye? I have a fondness for see-through recyclable packaging because in cases like this, it totally sells the product for you. Why blow money on package labeling when your product already looks awesome? Ahhhhhhhhh, there we go! These containers are sealed a little too well, but once you finally get it open, oh man, so fancy schmancy! Plus, I may have a cold, but I smell cherries!! Hehehe, oh I love looking at food. I took my first bite and the lasso of cherry flavor wrangled my tastebuds and wouldn't let go. This one is potent, and despite not usually digging a potent cherry flavor, it totally works here. Archer Farms brand gelato is made with skim milk which explains why I've got a quick melter here and so i'm scooping up this super soft cherry flavored frozen fiesta and it's totally working for me. The almond amaretto flavor is strong, and I don't usually like that, but its got my attention and I can't help but want more. What's wrong with me? First I'm putting down all the new stuff of 2012, and now I've fallen for a second fruity flavor? Maybe it's the soft, almost whip cream like nature of this one that I'm enjoying, or maybe it's the complete cherry vibe. Maybe that almond paste kicks in at just the right moment to turn this one from an also ran to a contender. I'm just in shock. I usually prefer a mild cherry/vanilla mixture, but I'm liking this one... time for another serving. Ok... maybe the second serving was a bit much. This is a potent flavor and I'm going way too fast. I definitely don't recommend getting too much pink stuff on a single spoonful, it comes off way too potent. I'm not really sure what would compliment this flavor, though there is a strong urge to scoop some into a glass of Cherry Coke. Who knows, maybe I was just in the right mood at the right time. Nice job Target, I obviously need to try your other gelato flavors. On Second Scoop: Just thought I'd come back to this one after a few weeks. The good news is I still like it despite how potent it is. It's definitely a different texture then what I'm use to. It's light, and so isn't as cold or as solid as my usual ice cream fair. Once the freezer clears up, I need to try some more of these flavors. Buy This Brand Again? Yup! By the looks of this it reminds me of the "premium" store brands of gelato from price chopper and hannaford. Same container and everything. I wonder if they all use the same private label and just slap on their brand name on them. Those cherry chunks are crazy! no chunks, it's whole cherries! I was thinking the same thing, though I want to say the Hannaford container is a bit thinner. I need to check manufacturing codes to see if they line up. it's probably the most potent gelato I've had to date. I have a feeling they might be similar. Price Chopper just released central market gelato a month or so ago. If this is also new at target, that's quite the coincidence if they're not made by the same private company. I've never had Gelatto; time to take the plunge! I am so glad I'm not the only one who struggles with packaging at times. I don't like when anything stands between me and my frozen treats. Not same, the target gelato has been around for the past year or so. they just start expanding it to more stores recently. i had it in my target for the past year and my cousin (lives in different state) never saw it at her store till now. I think every company should take customer suggestions! you wont get any argument from me, the texture is indeed very light and it's always reassuring to hear when people have a similar experience. gelato in Italy can be with artisan production, or industrial production. Not because it comes from Italy it is authomatically artisan or following all the principles of the hand crafted gelato. We have industries in Italy as well. When you purchase gelato at the grocery store in Italy you get an industrial product. what does it mean? it means that it is not as dense as handmade gelato. It means that the amount of air pumped in the product is comparable to the amount of air pumped in ice cream. well that makes sense, just like go to an ice cream shop is much more likely to get you a handcrafted product as opposed to going to a grocery store. there are a few artisan gelato places near work, i really need to go try them. 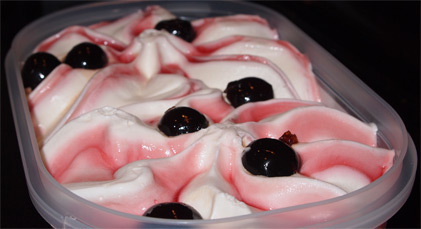 I LOVE the Amaretto Cherry Gelato but have such a time opening the container. Any hints to make the job easier? do you mean when you first open it? it's kind of like a blue bunny container, there is a little tab to pull and then it's best to always open from that particular spot.